I'm on a romance kick and I knew Kristan Higgins would deliver. Parker grew up privileged. No wait, filthy stinking rich. I can not relate. Her father loses all her money--and her son's--and all she is left with is an old shack in Maine that her aunt left her. Who also happened to be a hoarder. Ha ha! I smell a challenge! I actually think that would be amazing. A beach house in Maine. A fixer upper. It is picturesque! What Parker didn't plan on was her father's attorney coming to help her fix the house up. His young hot attorney. Hello! I'm game. I am so into this. They have a history too. There are plenty of flash backs to give us bits and pieces into how Parker and James know each other and the time they've spent together. They are spending the summer together fixing up this old house--well James is really doing all the work. What will happen?! I enjoyed it. My favorite character was James. I couldn't get enough of him. I wanted more and more of his point of view. I wanted to know what he was thinking all the time. I wanted him to get the girl! The setting is what is really great. The town and all the neighbours really made the story work. I felt there was sufficient character development to make a good story and I thought the romance aspect was delish! It is a bit more 'adult' so just be aware of that. 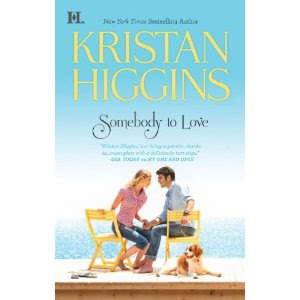 Kristin Higgins is becoming one of my favorite romance authors. I can't wait to read more of her work! I have a copy of this as well, and I've been dragging my feet on reading it for some reason - despite knowing how much I adore Kristan Higgins! Thanks for the great review, I'm really excited to read this now! This sounds like a great summer read. This kinda reminds me of The Secret of Joy where the main character loses everything and starts over somewhere else. Great review.